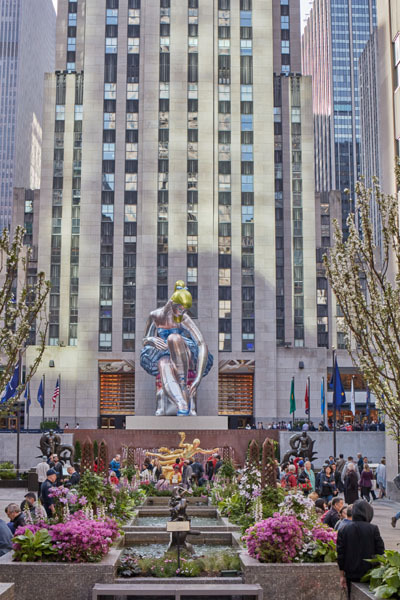 Kiehl’s Since 1851 and Art Production Fund are pleased to present Jeff Koons’s Seated Ballerina, a large-scale public art installation, hosted by Tishman Speyer at Rockefeller Center from May 12 – June 2, 2017. The inflatable nylon sculpture stands 45 feet high and depicts a seated ballerina from the artist’s iconic Antiquity series. Often referencing historical imagery and found objects, Koons based Seated Ballerina on a small porcelain figurine. The sculpture acts as a contemporary iteration of the goddess Venus, and symbolizes notions of beauty and connectivity. Its reflective surface mirrors its immediate environment and engages with each viewer. The work aims to bring awareness to National Missing Children’s Month this May, in an effort to support organizations like the International Centre for Missing & Exploited Children (ICMEC) that work tirelessly to create a safer world for children. In honor of National Missing Children’s Month, Koons has also created a limited edition Seated Ballerina tin for the Midnight Recovery Collection. Throughout May, Kiehl’s will donate 100% of its net profits from the collection, up to $100,000, to directly benefit ICMEC. A fervent advocate for protecting children, Koons worked with ICMEC to co-found The Koons Family Institute on International Law & Policy in 2007 to combat child abduction and exploitation. He also serves on ICMEC’s Board of Directors. The installation highlights the longstanding relationship Kiehl’s has forged with Jeff Koons and ICMEC since 2011. Art Production Fund has also worked on a number of projects with Koons since 2009, donating a portion of sales from its Works on Whatever Collection to ICMEC. 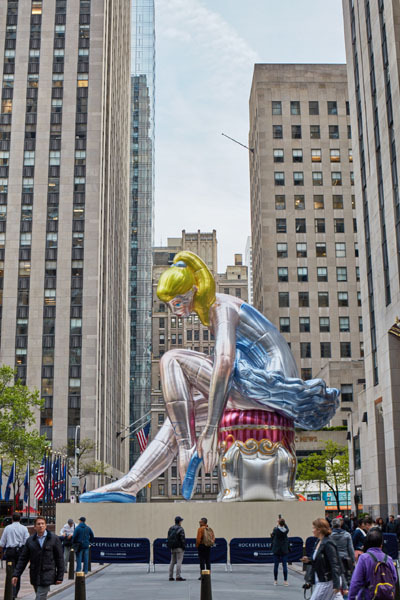 “ICMEC is proud and honored to partner with our long-term friend and Board member – the great American artist Jeff Koons – and with the iconic Kiehl’s Since 1851, in a campaign that raises awareness and supports our efforts to make the world a safer place for all children, says Maura Harty, President & CEO ICMEC. Jeff Koons was born in York, Pennsylvania and studied at the Art Institute of Chicago and the Maryland Institute College of Art; the latter from where he received his BFA. He currently lives and works in New York City. One of the foremost internationally recognized contemporary artists of our time, Jeff Koons earned renown for his iconic sculptures such as Rabbit (1986), Michael Jackson and Bubbles (1988) and his public sculptures, such as the monumental floral sculptures Puppy (1992) and Split-Rocker (2000), both of which were previously installed at Rockefeller Center. Tishman Speyer (tishmanspeyer.com) Tishman Speyer is a leading owner, developer, operator and fund manager of first-class real estate around the world. Founded in 1978 and led by President & CEO Rob Speyer, Tishman Speyer is active across the United States, Europe, Latin America and Asia, building and managing premier office, residential and retail space in 30 key global markets for industry-leading tenants. The firm has acquired, developed and operated a portfolio approximately 164.7 million square feet with a total value of approximately US$81.9 billion spread over 402 assets. Signature assets include New York City’s Rockefeller Center and Chrysler Center, São Paulo’s Torre Norte, The Springs in Shanghai and OpernTurm in Frankfurt. Tishman Speyer currently has projects at different stages of development in Atlanta, Boston, Brasília, Chengdu, Frankfurt, Gurgaon, Hyderabad, Los Angeles, New York City, Paris, Rio de Janeiro, San Francisco, São Paulo, Shanghai, Shenzhen and Washington, DC. The International Centre for Missing & Exploited Children is a private 501(c)(3) non-governmental, nonprofit organization. For almost 20 years, ICMEC has been a leader in identifying gaps in the global community’s ability to protect children from abduction, sexual abuse and exploitation, and expertly assembling the people, resources and tools needed to fill those gaps. ICMEC focuses on programs that have an impact on addressing the issues surrounding missing children, child abduction, child sexual abuse and exploitation. Through The Koons Family Institute on International Law & Policy, ICMEC conducts and commissions original research into the status of child protection legislation around the world to help make children safer.